Each photo opens in a separate window - remember to close it when done. After two months in Langkawi it was time to move on. We topped up our fuel tanks at Telaga Marina and steamed north. Yes, still motoring in light winds. 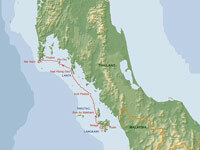 The 120nm trip from Langkawi to Phuket took us five days, with stops in comfortable and scenic anchorages every night. We were now getting a visual taste of the famous design of the islands of this bay - á la James Bond's Man of the Golden Gun. The island to port (above) is almost 300 metres high, and the narrower one straight ahead (named Koh Phetra) is more than 400! 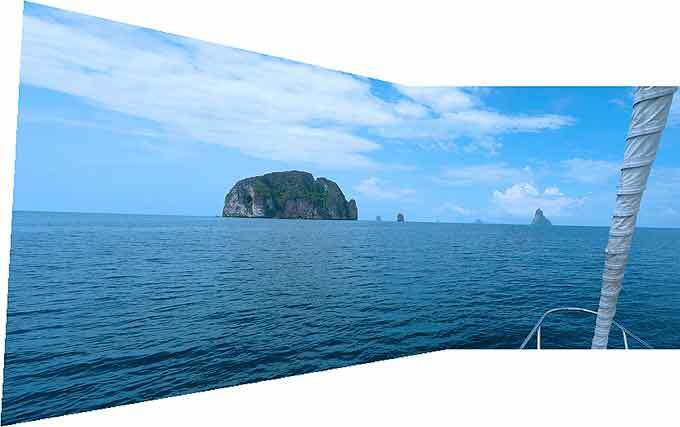 There is a fairly large trawler lying to the left of the island to port, and if you click on the photo you may appreciate the dimensions here. 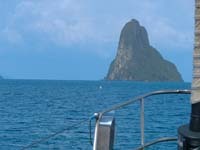 We are used to high volcanic islands, where the anchoring is difficult because the steep drop continues on a stony slope and it is too deep. Around these islands, however, you will find anchorages virtually anywhere, in just 10 metres depths with excellent holding ground - mud/sand. Our last stop before we arrived in Phuket was at Phi Phi Don island, which is southern Thailand's most popular holiday destination. The honeycomb cliff-faces rising steeply from surprisingly clear waters (for this area), together with the white beaches and enclaves of tropical rainforest attracts thousands of day visitors from the neighbouring tourist hubs such as Phuket and Krabi as well as from the resorts of Phi Phi Don itself. The action is quite unbearable during daylight hours, but late in the afternoon and in the evenings, when the crowds are gone, you can have it all for yourself - provided you are aboard a yacht. All boats on the photo below (except the sailing boat in the centre) disappeared before sundown. 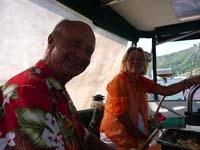 We officially cleared in to Thailand at Ao Chalong, a large bay at the SE tip of Phuket. 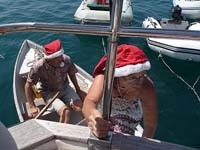 Thereafter we anchored in a couple of nice small bays along the coast before we joined dozens of other yachts at Nai Harn bay for Christmas and New Year. 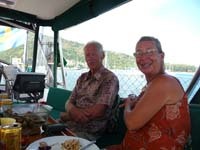 We met several cruisers whose paths we have crossed in various locations of the world during the past decade, among them Anita and Hans aboard the Swedish yacht Xora, which we hadn't seen since Deltaville, Virginia, in 2002. A panorama over Ao Chalong bay across the pool of a resort. Scorpio anchored in the background. Some of the resorts in this part of the world welcome cruisers to use their facilities for a small fee and a few times further south on our way north in the Malacca Strait, where the sea water looked less inviting, we could not resist the temptation of a fresh water swimming pool. 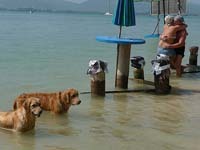 In Phuket the water was again (reasonably) clear, the first time since somewhere in central Indonesia. 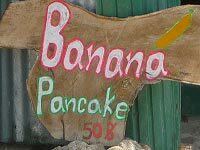 The resorts usually also have great restaurants, although we normally prefer to try some of the local, less pretentious establishments. 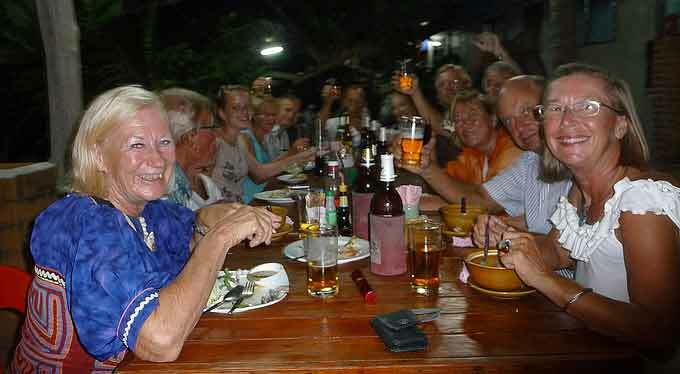 Not only is the food usually great, but the prices are unbeatable: Two (2) Euros for a lunch including a beer! Cool dogs and hot people! 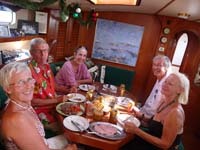 We celebrated Christmas with a long lunch aboard the Swedish yacht Roxy in company with the crews of two other Swedish boats, Xora and Blue Marlin, and the American yacht Pacific Star. 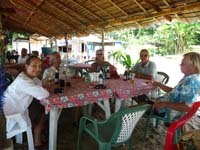 I am uploading this report aboard Scorpio in Nai Harn Bay on Boxing Day on the 5th anniversary of the Tsunami tragedy 2004. Scorpio is one of the yachts anchored on the photo above. This beach is in an area that was particularly unlucky when the destruction stroke, causing a great number of fatalities. Walking ashore earlier today I could witness some touching evidence of the grief the catastrophe caused. Read more in the blog .. The crew on Scorpio wishes all our friends a Happy New Year.